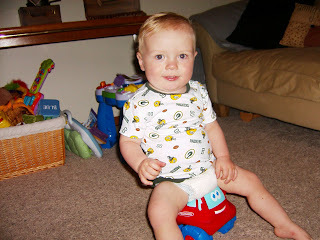 --Wow, how time flies....Braden is now 14 months and WALKING!!! It took him the longest time to build that confidence to just let go and GO! He showed us a few times that he could take about 5-6 steps, and then he'd stop and crawl. On Thursday, Rich and I bribed the heak out of him to walk to us back and forth across the living room. He finally did it and has been letting go of the furniture and cruising on his own. He looks like a little frankenstein, trying to maintain the balance....too cute! Watch out Snickers, here comes Braden! 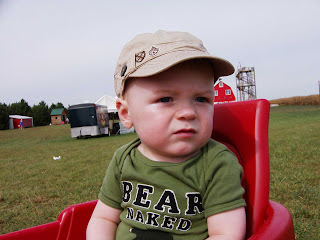 --Grandma and Grandpa LaCombe came down last weekend and gave Braden lots of lovin'. Braden even called grandpa "papa." 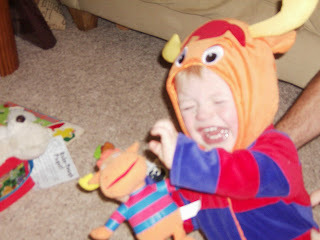 Here are some pics of last weekend and a few of him today all dressed up in his costume. We went to a Halloween party today at the Rybarik's....great treats and lots of fun. Daddy is paying for the "no afternoon nap" right now as Braden is having a difficult time getting to sleep. Enjoy the pics and we'll try to update sooner next time! Happy Halloween! 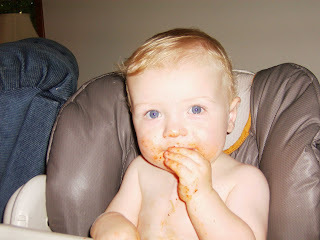 --Thank you for your prayers....Maddison and Grayson are both out of the hospital and doing well. 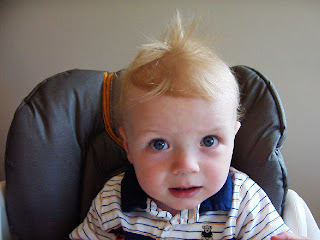 PS...you may notice B's funky left eye....major eye poke + blood thinner med = bloodshot eye! 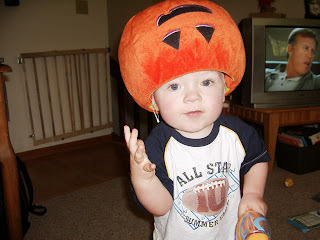 Daddy, I'm not a pumpkin head! 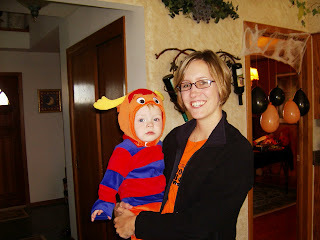 Mommy and Tyrone the Moose from Backyardigans. Once again we had another full weekend and have enjoyed making fun, new memories with B this fall. 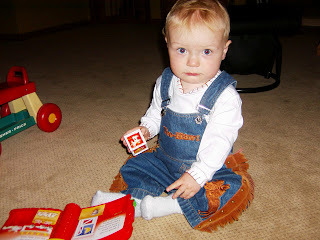 Last fall was such a blur as we lived quietly in our little bubble and didn't venture out much beyond doctor visits. 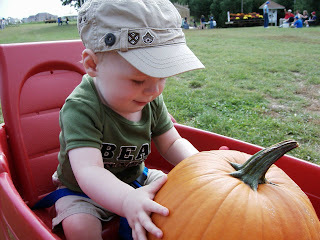 It's been fun decorating this fall, going to pumpkin farms, and making (or buying) B's first Halloween costume. Braden learned a new word this week - cracker. His version is "caca"....too funny! 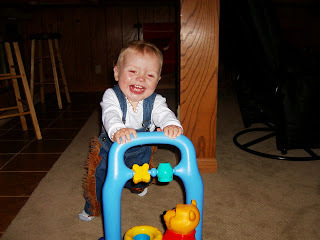 In the pics below, you'll see him pushing his Pooh cart - he loves pushing this all over the house. He steers it, picks it up and moves it, and practically runs with the darn thing...I'm just waiting for the day he lets go. I know, I know....I may regret saying that. Prayer request: some of our dear heart friends need your help. Both Maddison and Grayson were released from the hospital last week and readmitted just days later. Please pray for them and their parents - we know how much strength is needed to endure those long hospital stays. Could you also say a prayer for the Yuvenich Family? Judy was a former student and tragically lost her life in a car accident this past weekend. She was only 14 years old. So many heavy hearts are thinking of Judy and her family at this time. In ending this post, with good news, we want to congratulate the Posey Family on the birth of their baby girl, Sara Aubin Posey! We wish Sam, Carrie, and Sara the very best! Oh darn...wishful thinking on mom's part! 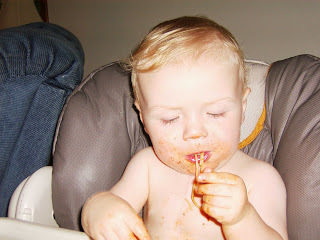 Spaghetti = an adventure, not just a meal! I know this oufit is cute mom, but the flashing camera is getting old! All good things to report from our appointments :) Yesterday we arrived at CHW around 9:30am for Braden's echo. The worst part was the sedation....nasty meds to make him fall asleep. During the echo we were able to catch up with Dr. Ghanayem and talk with her for a bit. After the echo, we were given the thumbs by Dr. Cava that his heart looked great. There's still some minor tricuspid valve leakage, but that is expected with the anatomy of his heart right now. It did improve from his last echo, which was great news to hear. The doctors were very happy with the rest of the echo also. The overall function of his heart, all things considered, was excellent. His heart continues to grow and function the way they expect and want it to. Today was a big testing day where we had to return to CHW. It was a Cognitive and Developmental Test. They ran him through a number of motor skill dexterity tests. Stacking blocks, lifting hoops, putting pegs in holes and other interesting things. The cognitive things were interesting too. He had to figure out how to get a bunny toy out of a clear box, get things by using sticks to pull things to him. Braden tested at the high end of average on the motor skills. If he would have taken more than two steps he would have surpassed average ratings (he still gets a little scared after taking a few steps and sits down)! The cognitive part he did very well and and scored in the above average range. He continues to impress everytime we go up to CHW. Yeah Braden! On Monday we got to see one of Braden's favorite nurses, Melissa, who was in the PICU with her son Grayson (after having heart surgery himself). Melissa was Braden's nurse when she first came back from maternity leave. She was definitely a huge help answering a ton of "at-home-care" questions before we left CHW last year. We were also able to visit with our friends the Watson's and their daughter Maddison. We were able to deliver our very first Heart of Gold Charity gift basket to them . It was great to see them in such good spirits. After a week of surgery, Maddison is recovering very well. She is still having some heart rhythm issues and hoping that with time and prayer, it will improve. Please continue to keep our wonderful heart families in your prayers. After the testing today we saw some more of Braden's favorite 4th floor nurses - Jenny and Jen (go figure) and got to hangout with Research Guru Lisa for a good part of the day. Braden passed out lots of cute pictures and business cards to them! Oh, and we almost forgot to mention a little visit from Gabe. His mom brought him and twin brother Jed by to say hello to us yesterday as they made their way to an appointment. Heidi and Christian were in over the weekend and they took us to the Sox/Tigers game Saturday night. Excellent game with a nailbiter finish. It was a very quick visit, but it was great to see them and have Braden spend some quality time with his Auntie Heidi! 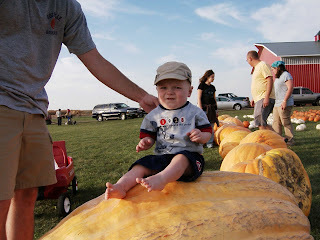 Gigantic pumpkins at the farm! 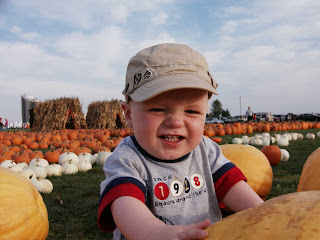 My first adventure to the pumpkin farm! Are you really taking a picture of this wicked "do"?